This is a particularly sweet victory for the German girls, who ruined their chance of a silver medal in the 470 Junior World Championships in Greece just a few weeks ago. “It is nice to win here after what happened in Greece,” said JURCZOK. 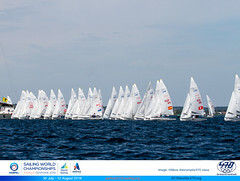 “We were leading the Medal Race and we were too excited. We went the wrong way around the leeward mark and we went from first to last.” Hopes of a silver, or even a bronze, evaporated as the girls slipped to 4th overall. 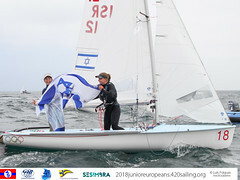 No such mistake here, and JURCZOKwas pleased with how she and BACHhad sailed in such challenging conditions on Lake Balaton. “I think the key was to make a plan, make a decision, and then stick to your decision,” she said. “That’s what we did and it seemed to work for us.” The fight for the Men’s title has yet to be decided, and while the French team of Sofian BOUVET and Jeremie MION have a useful lead of 13 points over second-placed Germans Ferdinand GERZ and Tobias BOLDUAN, the unpredictability of Lake Balaton means nothing can be taken for granted. The 10 teams due to contest the Medal Race went to a special briefing this evening with the umpires who will provide on-the-water, instant judging during the race. 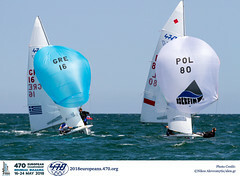 The other 21 boats in Gold fleet, along with the Silver and Bronze fleets will conclude their Championships tomorrow with conventional fleet races. Just a point separates the top two teams in Silver fleet, so the Italian leaders Paolo CATTANEO and Vittorio ZAOLI will be carefully watching their Hungarian rivals Botond SZIGETHI and Kristof JOO. In Bronze, a whole host of men’s teams are waiting to pounce on the current fleet leaders, the Hungarian women’s team of Réka VIGH and Kinga SZABÓ. Tension will be running high on the concluding day of competition in Hungary, not just in the Medal Race but in every 470 fleet.